The perfect Cape Cod getaway villa! 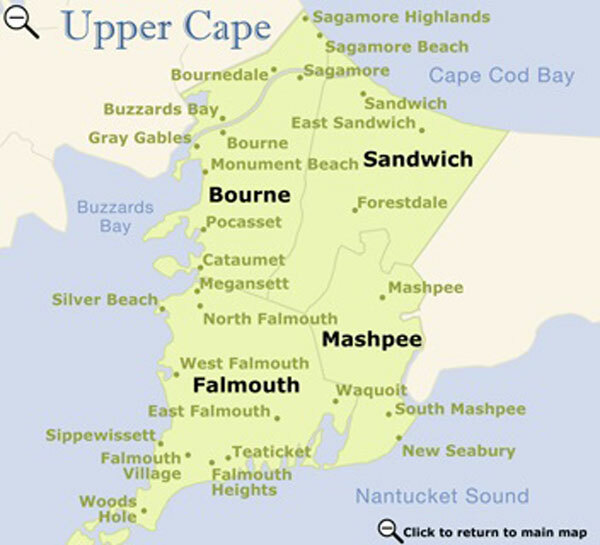 The Upper Cape comprises the towns of Sandwich, which is the oldest of the Cape towns, Bourne, Falmouth, and Mashpee. It is the first region you reach after crossing the Cape Cod Canal, which is the longest sea-level canal in the world, boasting 7 miles of bike and footpaths on each bank, where you can also fish or picnic. An estimated 30,000 ships and boats pass through the canal each year. Within the four major towns are the villages of Woods Hole, Pocasset, Sagamore and Sagamore Beach, and Cataumet. 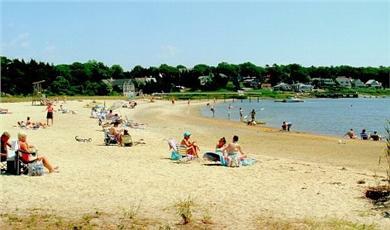 Mashpee is home to New Seabury, a large planned community also considered one of the Upper Cape’s villages. Bourne is located at the gateway to Cape Cod. The Cape Cod Canal bisects the town, with both the Bourne and Sagamore bridges, and the elevated railroad bridge all located in Bourne. English colonists lived in this area as early as 1627, and the first free enterprise in America was the Aptucxet Trading Post in Bourne. Bourne is a quiet community without the explosion of summer tourists experienced by some of the other Cape communities. The exception is the annual Bourne Scallop Festival held in September each year, bringing visitors from across the nation. Falmouth has what is probably the longest coastline of any town in Cape Cod – some 68 miles of coast with twelve sparkling public beaches. Enjoy sailing, windsurfing, kayaking, fishing, cycling, and jogging. There are six golf courses, nine harbors and scores of lovely ponds. The Shining Sea Bike Path takes cyclists along the edge of Vineyard Sound, while the world-famous Falmouth Road Race is held in August, with the scenic vistas of Falmouth Heights as its background. Woods Hole is home to the Marine Biological Laboratory and the Woods Hole Oceanographic Institution. An impressive number of 49 Nobel Laureates have taught, taken courses, or done research at the MBL. The Woods Hole, Martha's Vineyard, and Nantucket Steamship Authority provides the only year-round passenger and vehicle ferry service to the islands of Martha's Vineyard and Nantucket. Service is provided from Woods Hole to Vineyard Haven, and Hyannis to Nantucket. Seasonal service is also provided from Woods Hole to Oak Bluffs on Martha's Vineyard. Mashpee boasts fun for the whole family, with lazy days at the beach, great golfing, hiking and biking, wonderful shopping, and fabulous dining. There are also year-round and seasonal events, cultural activities, free outdoor concerts, deep sea fishing and whale watching. Mashpee is proud of its Native American history. The Annual Indian Pow Wow, whose participants at one time were mainly chiefs gathering to discuss problems and perform religious ceremonies, now involves tribes invited from all over the nation, as well as the local Wampanoag tribe, who gather together to celebrate their heritage in full Indian regalia. The Wampanoag Indian Meeting House, built in 1684 on Santuit Pond, is the oldest church building on Cape Cod. Sandwich evokes a feeling that one is taking a step back in history, as many famous buildings and sights retain the same appearance as they had in the eighteenth and nineteenth century. Heritage Plantation, Sandwich Glass Museum, the Thornton Burgess Museum, Hoxie House (the oldest house on Cape Cod), Daniel Webster Inn, Dexter Grist Mill and various art galleries, rare book and antique stores are some of the attractions. Sandwich's miles of beaches along Cape Cod Bay and fishermen and lobstermen leaving daily from the docks at the Sandwich Marina also add to this town’s charm.